the first question is: Why and who need a recruiter? So let’s start with the question Why and who need a recruiter? The market of candidates and employers is (almost) never in balance. Companies are looking for candidates and candidates are looking for vacancies on job-boards. Recruiters are placing vacancies and looking for candidates (CV’s) in case there is lack of candidates. About 20% of the job population is actively looking for a new job. Besides that the better candidates are not looking for a job, maybe 50% of the job population is not actively looking for new job but is open for it. Now a company has the orders but not the people to execute, so as soon as somebody is hired, the company it earning much more and can keep the clients satisfied. This is the moment that recruitment is getting very valuable for companies. For a candidate who’s been approached and likes the new job, it is also attractive. The disadvantage is that the recruiter needs to call maybe 100 potential candidates who feel bothered by the recruiter. Not nice for anybody. But the recruiter has its value for this one person. 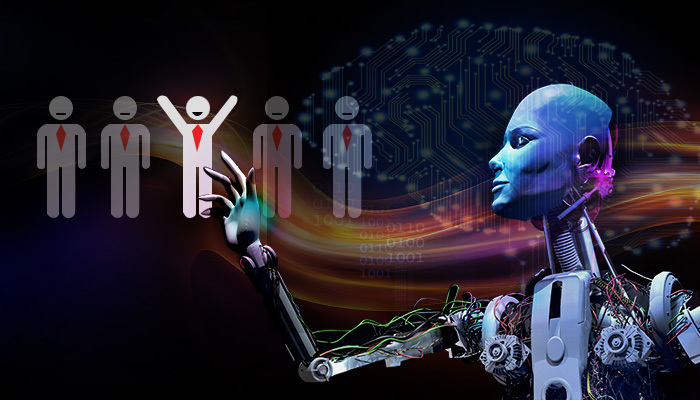 As we assume the problem the market of candidates and employers is (almost) never in balance is continuing to be the problem, we need to analyse how the different processes of recruitment can be step by step taken over by a machine. We did some research by offering IT recruiters help to automize or at least make parts of their process more efficient with machine learning and natural language processing. A recruiter told me that half of their time they sending on searching candidates and the other half of the time on approaching and personal communication. This recruiter was filling their database (ATS) by manually searching LinkedIn avond adding all IT people in certain location. The recruiters only needed to search in the ATS but also this took time as the Boolean and semantic search is far from perfect. Another recruiter said that they checked in other sources like Job boards adjudged qualified the candidate as active- or latent seeker. After finding the right candidates or actually make a long list of potential candidates the candidates needs to be approached. It is an intensive process of calling and mailing. Then the right candidate who is interested need to be instructed for the interview. The search might be better and automatically based on the text in the vacancy. It reads the text of the vacancy and find candidates that fulfil the requirements but also have a higher change they are not satisfied with their present job, a visualisation of their career, the expected salary and direct the contact data. In other words the search should be faster and better. Better it will be if it can find the candidates that are fitting to the offer so if a recruiter can contact the right person without bothering to much people. The approach is the other part of the recruitment job. Here the argument of the recruiter is that it is people work. But is it people work? Do people want to be disturbed by a recruiter who offers them a job they don’t want anyway? Or if you turn it around, is the personal approach better or at least needed. Is an email better then a call. Or can you approach people by chat or SMS. Fact is that a phone call is more offensive as a text message. Probably the way of approaching is very dependable of the person but also the right moment. For my opinion it it’s worth to try the communication via chatbots eventually combined with human support. Combining the better prediction if people might be interested in certain job for certain company in certain location. With a less offensive approach should definitely improve the image of the recruiter. Our maybe we should turn it around and let the candidate be in charge. Based on sources you will know more about each candidate and systems can better predict who likes and who is offended with certain job offers. Why and who need a recruiter? It is very dependable how fast AI systems can learn to know the individual needs of latent candidates. In other words a better search. As soon as the recruiter or the system knows the candidate better the approach is easier for a recruiter as a chatbot as well. When the chatbot works well it might be less offensive then a calling recruiter. Summarized it mainly depends on the good working and accepted technology if we need recruiter. But there will be definitely a group who only wants to talk to real people.